Monte Mario is the hill which closes the little marshy plain north of Castel Sant'Angelo which was called i Prati (meadows) di Castello. In the valley between the two peaks of Monte Mario there was the Friary of S. Maria del Rosario. 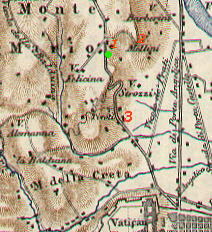 The view is taken from the green dot in the XIXth century map below. 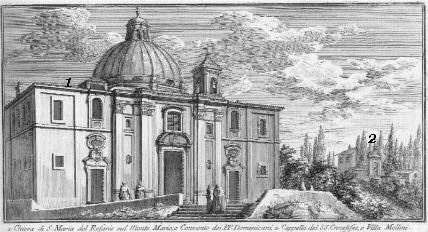 In the description below the plate Vasi made reference to: 1) S. Maria del Rosario; 2) Cappella del SS. 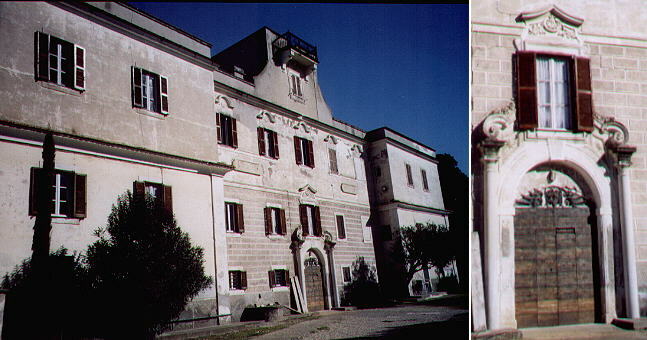 Crocifisso e Villa Mellini. The small map shows also 3) S. Lazzaro in Borgo. Today's view of Monte Mario is not very different from that of the past . The 1841 print shows a line of trees going up the hill. They flanked Via Trionfale (Triumphalis) a road linking Ponte Trionfale with Via Flaminia and which was part of the itinerary followed by the consuls returning to Rome to be recognised for their victories in a procession called triumph. S. Maria del Rosario is today a Nunnery and behind it there is one of the poshest boroughs of Rome. 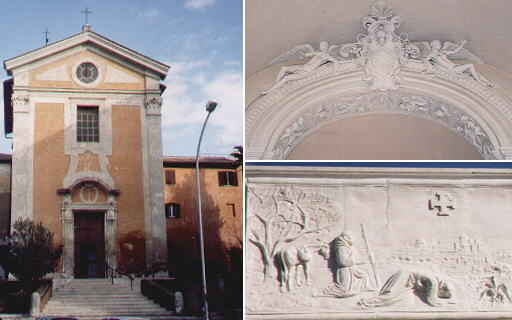 The façade was built in 1726 by Filippo Raguzzini during the pontificate of Benedictus XIII. 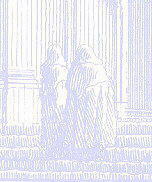 The pope had been a Dominican friar and the monastery belonged to the Dominicans. 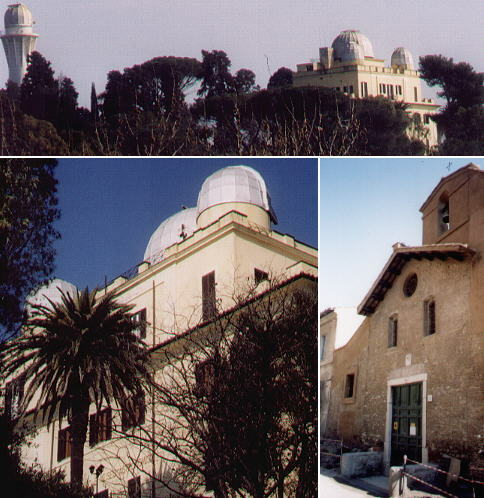 Villa Mellini, today the seat of the astronomical observatory of Rome (once in Collegio Romano) was built in the XVIth century and it was known for its excellent view over Rome. S. Lazzaro in Borgo is a tiny XIIth century church at the foot of the hill, now a bit difficult to find as it is hidden by modern buildings. Read Henry James's account of his visit to Villa Mellini in 1873. The little chapel of the SS. Crocifisso mentioned in the plate is lost. 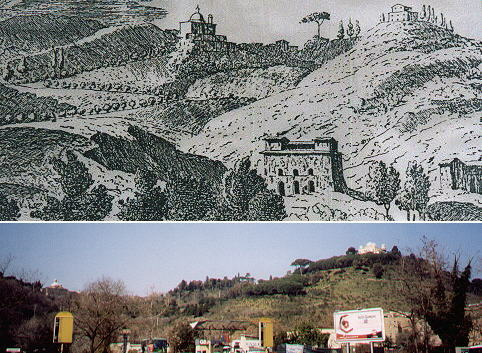 The small church dedicated to St. Francis is located along Via Trionfale where St. Francis first saw Rome. Today the urban development of Rome obstructs the view. The church was built during the pontificate of Benedictus XIII and it has the fine (and not very expensive) stucco decorations typical of that period. A modern relief shows the reaction of St. Francis when he first saw the Eternal City. Abito alla Balduina "I live in Balduina" is not only an indication of where you live, but a sort of status symbol which says that you are very wealthy (or that you pretend to be). It is very expensive to buy or rent a flat in this modern quarter of Rome, built on the rear part of Monte Mario on the site of some old villas, chiefly of Villa Massimo. The pines which here and there embellish the most expensive houses belong to the old villa. Its main building still exists at No 296 of Via della Balduina, behind a modern church. The two wings have lost their late XVIIth century decoration, but the central part retains it. From this point the Massimo enjoyed a great (although remote) view over Rome. 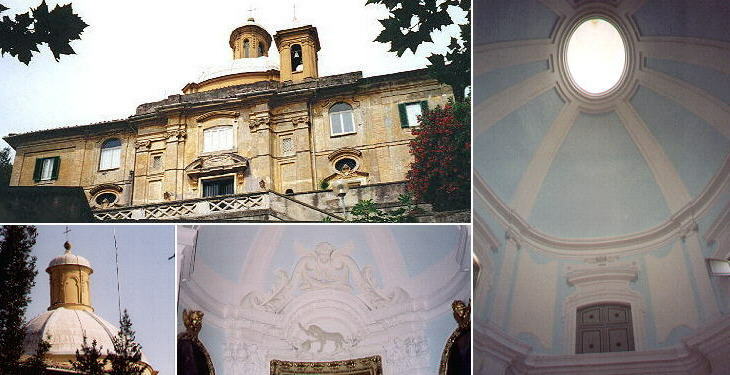 Villa e casino Mellini Non già da Mario Console, ma da Mario della famiglia Mellini Romana, prese il moderno nome questo monte, mentre avendo nel Pontificato di Sisto IV. eretta questa villa nel più alto e delizioso luogo del monte, che malo dicevasi, egli cambiolli il nome in monte Mario. Dalla parte di esso verso ponente, e verso il fine delle vigne, evvi la chiesa di s Francesco di Assisi edificata dall'abate Neri con il convento, ove oggi abitano i frati Girolamini di s. Onofrio, i quali amministrano la cura delle anime di quella contrada.